According to tradition or calculation (compare Deut. xxxiv. 8 and Josh. i. 11, iii. 2. iv. 19), the anniversary of the death of Moses (Megillat Ta'anit, last chapter). Josephus ("Ant." iv. 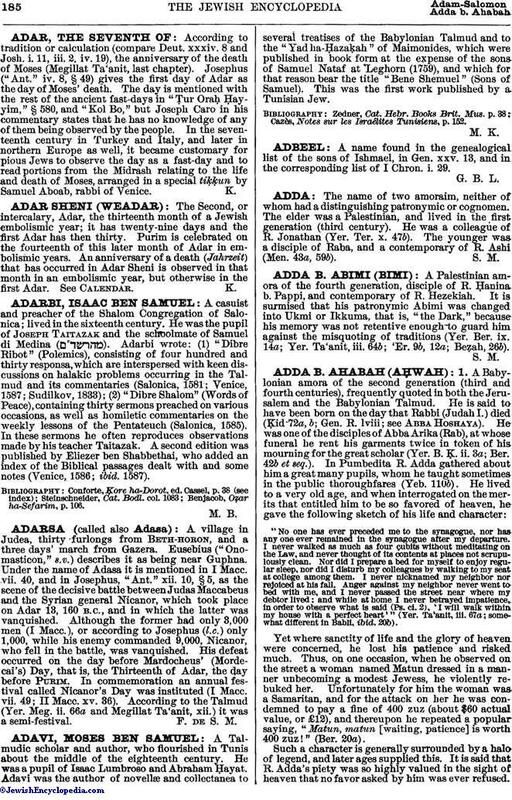 8, § 49) gives the first day of Adar as the day of Moses' death. The day is mentioned with the rest of the ancient fast-days in "Ṭur Oraḥ Ḥayyim," § 580, and "Kol Bo," but Joseph Caro in his commentary states that he has no knowledge of any of them being observed by the people. In the seventeenth century in Turkey and Italy, and later in northern Europe as well, it became customary for pious Jews to observe the day as a fast-day and to read portions from the Midrash relating to the life and death of Moses, arranged in a special tiḳḳun by Samuel Aboab, rabbi of Venice.